Sadly the original Borough Charter was lost when there was a fire at the property of William Everall, of Shrawardine, the last Lord of the Manor of Ruyton XI Towns. When Edmund, Earl of Arundel acquired the Manor of Ruyton in 1301, it was probably the existence of the castle when suggested to him the potential importance of the village. The River Perry had been the boundary between England and Wales for generations and much blood was spilt when the men of Ruyton and Baschurch carried on their own private war. The Borough of New Ruyton, or Nova Villa de Ruyton, was created and confirmed buy King Edward II in 1308. The New Town was taken out of, and split in two, the original township which was now called Old Ruyton or Victus Villa de Ruyton. The new Borough included most of what we think of as the centre of the village today, but not the church or castle – see the map below. The western half of Old Ruyton was the deer park up to Blackbow Hill. The crossroads by the old school is still known as Park Gate. The Cliffe was the Lord`s Common and belonged to neither the Borough nor the old township. 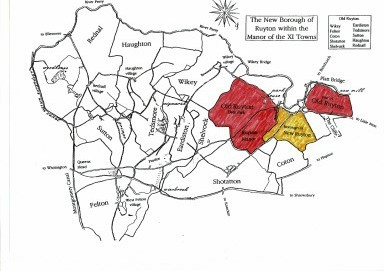 Thus, the new Borough of Ruyton was created within the manor of the eleven townships – remember, they were settlements rather than towns. They all still exist today, although Shelvock and Coton are each reduced to just one house each. These are the privileges granted by the Charter:- The Burgess, or householders, of Ruyton may have a free borough and anyone who takes a Burgage Place and their heirs must pay the Earl of Arundel and his heirs 12pence for the house and 4 pence for each acre to be paid in two instalments, on the Feast of St. Michael and on the Feast of Annunciation of the Blessed Virgin Mary. A Burgage Place was a house and three acres, this was considered sufficient to support a family. The 24 pence or two shillings, annual rent can e judged against the 3 shillings which a wagon horse was worth and 9 pence for a pig. The Burgesses were granted freedom of passage, tolls and taxes throughout the Earl of Arundel`s lands but not the throughout the Kingdom, as in some Royal Boroughs. The Borough was to have the Laws of Bristol and its citizens were to be equal with the citizens of Shrewsbury and Hereford. Bristol was also a `New Town` created by King John and he had given it a very full and detailed Charter which was used as a model for many other new boroughs up and down the marches between England and Wales. The Burgesses of Ruyton were to have a Guild Mercatory, an association which could make its own by-laws in order to control all trade in the borough and the forerunner of the Corporation of a town. Through the Guild they could regulate the price and quality of bread and ale. As an inducement to bring more people into the Borough, any stranger could, if he paid his dues and did his share of public duties for a year and a day, be entitled to become a freeman of the Borough. Living under the powerful Marcher Lord already meant that the Earl of Arundel`s tenants came under his law and were exempt from the Laws of England. The Burgesses were granted the right of criminal jurisdiction to apprehend, judge and imprison all thieves, homicides and evil doers who may come into the Borough. Also, a civil court was to be held every three weeks where the Burgesses were to be jurors but would probably be presided over by a bailiff acting for the Lord. Even the Lord of the Manor and his heirs must pay for any provisions, within forty day and nothing else to be provided until the debt be paid. For each brewing in the Borough, three gallons of ale must be given to the Earl – this would no doubt be for the garrison in the castle. None may brew unless by consent of the Burgesses. Brewing was evidently the principle trade in the Borough. The Burgesses, with the other tenants, were to have the use of pasturage on the Common lands throughout the Manor. These privileges, although extensive, were not equal with Shrewsbury and Oswestry in that there was no provision for the election of a Mayor and the rents due to the Lord were assessed individually rather than a fixed sum the Borough which the burgesses allocated between themselves. Three years after the granting of the Charter, the Earl obtained another charter from the King – to hold a market in Ruyton every week on a Wednesday and a fair annually on the Eve of John the Baptist and the three days following. The right to hold a market, even in the independent area of the Welsh Marches, still required consent from the Crown. In 1407 Thomas, Earl of Arundel granted a charter for a fair and market to beheld in the Borough of Oswestry where he was also Lord of the Manor, with a clause which said that no cattle, corn, victuals, merchandise or anything else was to be offered for sale in Melverley, Kinnerley, Edgerley or Ruyton XI Towns unless it had first been offered at Oswestry Market. This was probably led to the demise of Ruyton`s market and fair although it was still functioning in the mid 18th century and there was an attempt to revive the market in 1795. Up until the early 1970s a small funfair was held in what is now the school car park, possibly this was the last gasp of the Ruyton XI Towns Borough Fair on the feast of St. John the Baptist day and three days following.